The Camargo Club is set amidst undulating countryside on the edge of Cincinnati in the State of Ohio. It’s a Seth Raynor jewel which opened for play in 1925. Famous for its outstanding one-shotters and inspired routing, Camargo could perhaps be a World Top 50 ranked course if its collection of par fives was a little stronger. Having said that, its par threes are simply magnificent with arguably the finest one-shot course collection in the world. You’ll need an invite to play Camargo but stick with it, if you do happen to befriend a member you are in for a treat in the tranquil and surreal world of Camargo Club. We hear that The Camargo Club has been stewarded through restoration work at the hands of Renaissance architect Tom Doak. Doak’s affection for classic courses is well known and we understand most of the restorative changes have been focused on bunkering. If you have any news about this, we’d love to hear from you. I get a chance to play on Mondays. This is a masterpiece. Perfectly maintained and conditioned. The par 3's are everything you hear about and more. Very challenging terrain changes and contours on the putting surfaces. One challenging test of Golf. Considering the length, Camargo still offers a wonderful test of "Shot Shaping Technique".... The Course is always manicured to the max...Seth Raynor is a "Master" of Putting Green shapes and contours!! Bobby Jones was known to play Camargo on a regular basis...that speaks volumes about it quality! The beguiling Camargo is situated on rolling terrain and has a masterful routing within a large swath of land that makes you feel like you are in a park. There are no houses surrounding the course and there is a large buffer around the edge that gives Camargo an open feel. The sweeping vistas create a sensational impression. Similar to Piping Rock on Long Island, the course was routed around a polo field. As is typical of Raynor or Macdonald courses, the design has all the prototypical holes you would expect, such as a Biarritz, Eden, Short, Redan, Road, Alps and Punchbowl. I liked the feel of Camargo right from the get go. It is an unspoiled masterpiece. Thanks to an enlightened membership, the course has changed little since it was built, and it is like being transported back in time. It's as if you are able to step back in time and play baseball at the Polo Grounds or Ebbets Field in 1922. Arguably the best course in Ohio and most certainly one of Raynor's best efforts. This property may well be one of the best suited pieces of land for Raynor's style in my opinion. Of course you will find all his template holes as mentioned. The course is in pristine shape, on top of that it's clearly obvious that all cylinders are firing in perfect timing there. A top notch Super, an architect that respects tradition and guides restorations/renovations in the perfect direction and a club management wise enough to lead everything in the right direction. Camargo is a treat for any lover of golf course architecture. Not a repetitive or mundane hole at the place. It's understandable why it's known for it's par 3's as they are indeed fantastic. The Redan would have to be my favorite, even though it robbed me of my first ace by perhaps a millimeter. From the tee it just suits my eye very well. With the huge drop offs around the greens it's best to aim well to the safe side of any sucker pin placements. The challenge is that the green surfaces are enormous so it's easy to hit the green and wish you were chipping rather than attempting 50-foot putts on greens full of gentle undulations. I played in a pretty good rain shower that lasted the entire round, but even so the course was draining perfectly and just a joy to play. Enough so that I would of loved to head straight back out, though it would of been rather cruel to my host who braved the weather perhaps only to treat me to something truly special. I wish I could automatically put this on the must play list for everyone who loves architecture but the reality is that Camargo is very private and doesn't have that many members so it's unfortunately difficult to see. Nonetheless, it's worth a special trip in my opinion from anywhere if you have a chance to visit. I caddied at Camargo for 10 years growing up from age 13 to 23, once I was done with college. I played golf in both high school and college and remain competitive today. I've had the chance to play many amazing courses in the world and I still hold Camargo near and dear to my golfing heart. I've played St. Andrews, Scioto CC & Oakmont. The comments made about the restoration of the bunkers is correct. They were redone about 5-7 years ago. 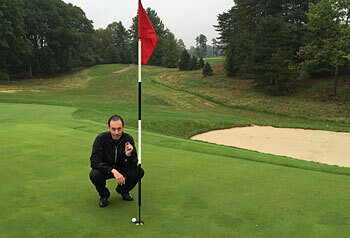 They took the lips out of the bunkers, meaning there is no chance of burrying the ball in the side of a bunker. They changed that to be grass lips rather than sand lips. All lies in the sand are now flat lies. It's more true to its original design. The greens are the toughest part. They are extremely large and subtle, gentle breaks are what are most difficult to read. They are the smoothest, fastest greens I've ever played. I can't say enough great things about this course. I can't wait to go home and play it again soon. Camargo has brought back the original green sizes which increase the putting surfaces from 175,000 sq ft to over 220,000 sq ft. In line with this, the bunkers were also reset with the original angles and in some cases some bunkers were restored. The Eden, Biarritz, Short and Redan could equal all other so named holes. Picture The National, Yeamans Hall, St Louis, Yale, Chicago, Shoreacres; par threes are the hallmark and at Camargo, they are the test. I am a member of Camargo and have played the course in over 30 US Amateur Q's as well as many other events. For stroke play as well as match play it is a treat. I had the pleasure of playing this course on Thursday August 13th. A great treat, spectacular setting. And the best set of par 3's after Cypress Point that I have ever encountered. I was fortunate enough to play 36 at Camargo last Friday. The par 3's are simply awesome and the course is in magnificent shape. A number of trees were lost since I played the course last summer, However in many ways that has helped. It is always a treat to play a Seth Raynor gem and it must be considered one of the best inland courses in the US. I had the pleasure of playing 36 holes in the US Amatuer Qualifier in 2006. The golf course was set up extraordinary and was quite difficult. Although not long on the scorecard, with the rolling lanscape the course plays quite longer than listed. Probably the most intimidating second shot course I have played. If you miss the greens...good luck making par. Built on 260 acres, it is one of the best inland golf courses in the world. Restoration work over the past 15 years has been done by Tom Doak. My dad is a member at Camargo. The changes are mostly bunkering and clearing out some of the honeysuckle and other unneeded brush that is destroying the sorrounding forests. It looks better than ever in my opinion.